This podcast features some monster players, particularly on alto sax. We start with Greg Abate as we did last week, and expand to some other great alto players in Jackie McLean, Cannonball Adderley and Art Pepper. We move to the tenor next with a couple of tracks from John Coltrane. Trane teams up with Monk and Ellington on these two tracks. We keep to the masters with pianist Bud Powell. It doesn't end there as we continue with a duo from Frank Morgan and John Hicks. We end the podcast with a more modern sound from tenor sax player Donnie McCaslin from his latest CD. Our featured album, Monsters in the Night from Greg Abate, sets the pace for some monster playing throughout this podcast. We get primed for Abate's upcoming performance at a Halloween concert at Chan's in Woonsocket, Rhode Island on October 28. Next up is Rob Garcia 4 from a new CD that was featured at last night's show in New Haven. We play one from his album and then tracks from CD's from the rest of the band, Noah Preminger, Dan Tepfer and Joe Martin. We also feature new albums by Rudresh Mahanthappa and a compilation CD of Miles inspired music called Miles Español. Just some random tunes on a brisk autumn eve. Starting out with some new music, strings and all from Ben Williams, we transition to another new release from Brooklyn based Rob Garcia 4 and his album of original compostions. Rob and his quartet will be appearing next Friday Oct 21 at Firehouse 12 in New Haven, CT. Rudresh Mahanthappa is on fire on the next track from his new album Samdhi. We chill out after that with tracks from Ambrose Akinmusire, Freddie Hubbard, Charles Lloyd and the Hammond B3 based group Cinque. This podcast celebrates the great time had at the Northampton Jazz Festival in western Massachusetts. 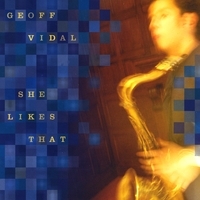 We feature a great CD by young tenor sax player Geoff Vidal who appeared at the fest with Linda Oh, also featured here. Also at the festival was Marcus Strickland's Quintet and Jonathan Kreisberg, a fine guitarist. We conclude the podcast with a couple of relatively new cats on the jazz scene that we have been taking notice of lately, Joel Holmes and Josh Evans. I have dug out this podcast from 2009 that celebrates the birthdate of John Coltrane (September 23) as well as the Autumnal Equinox. What better way to pay tribute to both than by playing Coltrane's classic Equinox. We'll follow this by Steve Kuhn's rendition of Autumn Leaves. Much more jazz music follows from Ahmad Jamal, Rudresh Mahanthappa, Art Blakey and others.